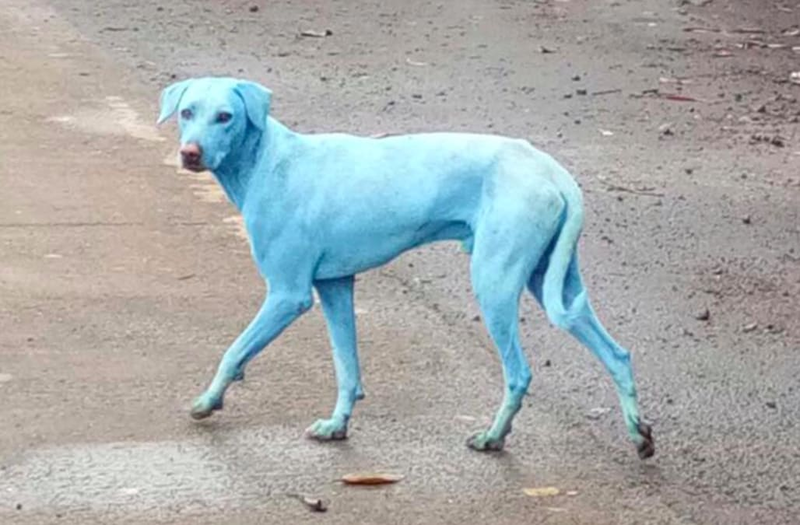 Bright blue dogs are cropping up around the city of Mumbai -- but before you try to put your name down with any designer dog breeders, know that the reason behind their odd coloring is actually pretty tragic. Activist Arati Chauhan, head of the Navi Mumbai Animal Protection Cell, says that dye-producing factories in the Taloja industrial region have been dumping untreated chemical waste into the Kasadi river, which stray dogs often drink from and swim in. According to Chauhan, this polluted water is not only sickening the local pooches -- it is also turning their fur a bright shade of blue. "It was shocking to see how the dog's white fur had turned completely blue," Chauhan said. "We have spotted almost five such dogs here and have asked the pollution control board to act against such industries." According to the Times of India, local fishermen also submitted a complaint to the state government in 2016 after fish started dying in large quantities in the same river due to pollution from nearby factories.